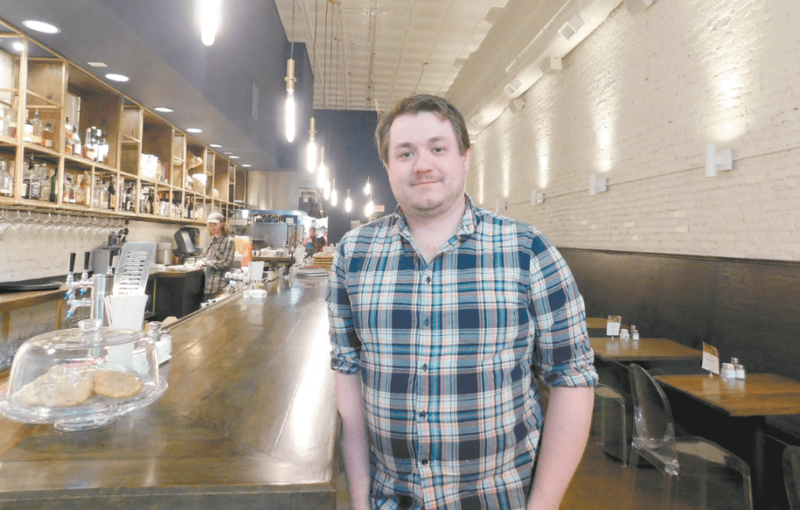 Brick & Tin head chef Bradley Jennings at the recently remodeled downtown location. Journal photo by Kennedy McJunkin. Brick & Tin’s head chef, Bradley Jennings, thinks grown-ups should be eating their vegetables, and he has found a better way to serve them. Brick & Tin will showcase one of its vegetarian dishes at the 22nd annual Corks and Chefs tasting event, April 27-28. Brick & Tin is one of more than 15 restaurants highlighted in this year’s event, which is sponsored by Magic City Art Connection (see story nearby). Last year was Brick & Tin’s first year in the event. It served an asparagus salad with large pieces of asparagus, sugar-snap peas and carrots. Jennings described the salad as a nice mixture of spring vegetables with no lettuce. This year, Brick & Tin will feature a vegan pea salad with English peas, crisp vegetables and a bright curry dressing. 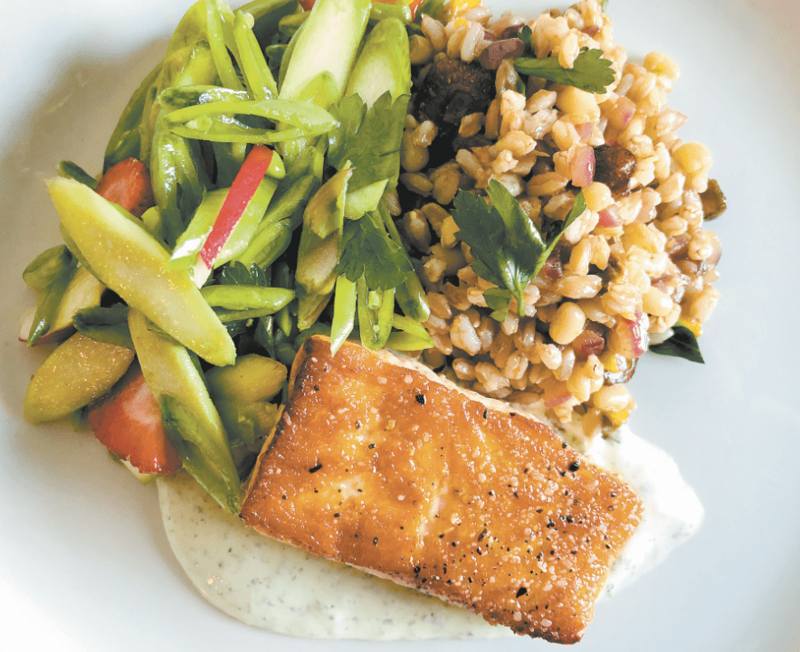 Brick & Tin’s Spring Fish is served with farro and a crunchy spring vegetable salad made up of sugar snap peas, asparagus, sun-dried strawberries, pistachios, parsley, extra-virgin olive oil and lemon. Photo courtesy Brick & Tin. Jennings, who is from Nashville, is the only boy of three sisters and has wanted to be a chef since he was 14 years old. He moved to Birmingham eight years ago and started working at Highlands, then Bottega Cafe. Jennings worked through all the stations, starting as a dessert plater under Frank Stitt. Jennings started working for Brick & Tin in 2014, the same year the Mountain Brook location opened. Owner Mauricio Papapietro opened the first Brick & Tin downtown in 2010. Jennings and Papapietro collaborate on menu creation and say they often get the best inspiration from their families. The menu rotates seasonally based on what the farmers produce and what the season warrants. The Mountain Brook location alone uses 800 pounds of tomatoes a week during the summer. Jennings explained their most popular summer menu item is the Tomato Salad. “Our farmer in Coleman, Trent Woods, has started planting more tomatoes to satisfy what we need,” Jennings said. Jennings thinks a great vegetable can be found in every season.